Well, I had just come off of a record setting two weeks of overtime/doubletime at work so I wanted to head for the hills and get out on an overnighter. It is surprising how refreshing they are to the spirit and mind, providing a bit of a 'check-out' time. It has been a very mild summer here in So Cal, but the brown is still in town and things are dry and dusty. To help out with all those things, I headed up to elevation at Mt Pinos in the Los Padres Forest, only a 40 minute drive from home. Parking at a friend's house in the community of Pinion Pines, I gave myself about 3 hours to see how far I could get up the mountain. The climb...well, it is ALL a climb the way I did it the first day... could be as long as 8 to 10 miles and gave me a choice of pavement or singletrack. I mixed it up a bit and rode about half and half in the interests of time. Making it a bit more interesting was the choice of pack mules for the night, the SS Jabberwocky. I normally ride the Lenz Lev for this type of stuff, but I wanted to see how it felt on one gear packed up for an S24O. It actually was quite good all in all, but I sure ran out of gear fast. Good thing I brought my feet with me, cuz I sure used them a lot. Walking teaches humility. I am very humble now. Part of the reason was that the trail I rode up for the first 3 miles of dirt (after several miles of pavement climbing) is pretty steep. McGill trail is a local fav as it allows easy access for shuttle monkeys (unfortunately) and is ribbon of narrow trail clinging to the shoulder of the mountain. I walked probably half of McGill, but since most riders are on the granny-granny on this trail anyway, I was not moving much slower than the average bear. Still, I was moving slower plus I had begun back down the highway aways and the combo was robbing me of daylight. I was running out of light and legs by the time I hit Chula Vista and the parking lot on the end of the paved road. Greeting me was a sea of motorhomes, all getting set up with telescopes for the celestial wonder that 8000' feet of elevation and little light pollution offers. That meant noise though, and I already heard the barking dogs and clatter of the group. Getting away from this area only required a bit of riding/pushing up the last section of dirt for 100 yds till I spied a rocky knoll off to the right that looked like it would give me a quiet and secluded camp spot. It did. I had seen afternoon clouds hanging around Mt Pinos as I was packing, so I brought the REI Chrysalis tent and storm fly. It is a nice nest for one. Dinner was chunky chicken spread on a cheese roll, pringles, both providing salty goodness, some cookies, and the prize of the night, a small chocolate milk that I had wrapped in a thin ice pack and tucked into my clothes in the pack. Oh man...that was yummy. As I ate dinner, I had changed out of my damp riding clothes but I wondered if I had underestimated the temps. At just under 9000', it was pretty cool already at dusk. I did not want to get too cold, so as slight shivers accompanied the evening's arrival, I hit the tent and my sleeping bag. I really need to re-visit my sleeping kit. The Deuter Dreamlight 500 sleeping bag is a very tiny package and fits into any pack, but the 50 degree rating is optimistic. As I am a cold sleeper, I added a bag liner and some extra clothes...wool Swiftwick socks, arm warmers, leg warmers, my baggies (less the chamois), and a long sleeve T capped with a Pearl Izumi head cap. I try to make the clothes I wear do double duty for riding, camp time, and sleeping. Still I was cold at the wee hours of the morning. I think I err'd in covering myself with a mylar blanket. I have been experimenting with the limits of adding a burrito cover using a space blanket cut and taped into the shape of a quilt. This night was the worst I had seen as far as building condensation between the sleeping bag and the space blanket. Not good. I don't think it was soaking the bag, but it would have eventually and the moisture was likely getting trapped into my bag and clothing. The chills that came along with that moisture were an unwelcome guest. I am looking at making a quilt from a kit here. I sleep on a 3/4 Thermarest mattress and, using the backpack as a base, I add an inflatable pillow to keep my neck straight. I am a side sleeper, so I need some support there. It works really well. 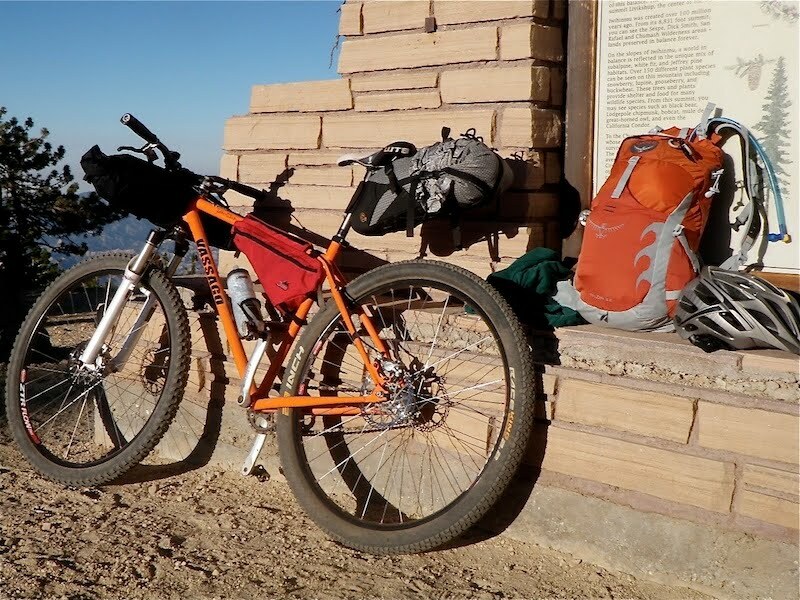 As far as packs go, I used the new Osprey Talon 22, possibly the most honored and revered bikepacking pack out there. It holds as much as I would want to put on my back and pedal with and it may just be the most comfortable pack I have ever worn. One thing I noticed was the weight swinging my shoulders around when I was standing climbing on the SS Jabber. I got used to it, but it did feel odd at first. I made the summit at Condor Peak (first pic) as my breakfast stop, then turned back down toward the truck, a multi-mile serving of singletrack. We used to be able to keep riding over the summit of the peak and drop into two distant valleys. Now this area is wilderness and verboten to bikes. Silly. I can take a poopy, trail whomping horse there, but not a smooth rolling, non-poopy bike; more religion than science going on here. Although, I will say that McGill is feeling the effects of too many bikes riding at too high a speed and the turns following fast sections are bombed out pretty good. Poor riding habits and lack of skills add up to toasted trails. In contrast, my SS and I rode a pretty conservative pace and hardly ran into another soul all the way down. I really enjoy the S24Os. Besides the fun of them, it is allowing me to refine my 'kit' so that I will be ready for multi-day trips. 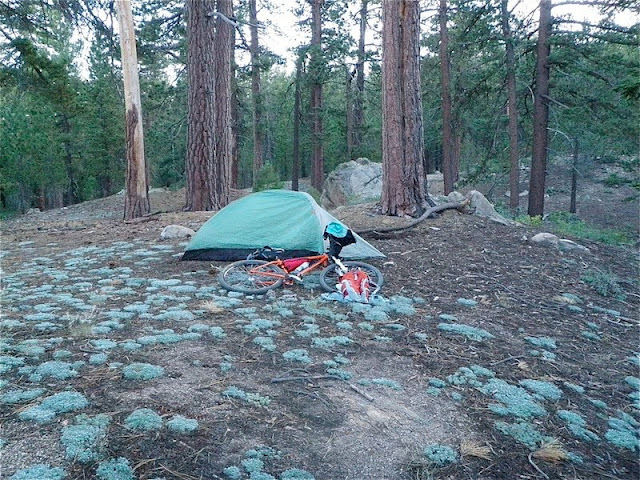 Bikepacking is very cool, and I actually liked the SS as a way to approach it. If I was a stronger rider, it would have been less walking, but so be it. I think I would choose gears for most trips like this, but I am sure I will keep the SS around as an option to camping trips. More flavors keep life interesting. I actually liked the hardtail approach for bikepacking and I think I am going to convert the SS Jabber to rigid in the future. I have another SS getting built up that will be the yin to the yang of the Jabber, allowing me some options here. S24Os rock. The next one will be in October most likely as September will see me off the bike for several weeks. Fall will be a great time to hit Liebre Mtn and the Golden Eagle trail. It looks like you're using one of Epic Eric's seatbags? Do you find its profile to be a detriment when going down steep downhill stuff? I was looking at that bag for an upcoming tour I'm doing in the San Juans, but reading a journal of a rider who did it last year, he said whatever bag setup he had stuck up too high, and thus he felt he couldn't get in aggressive enough of a position on some of the steeper descents. Thus I'm wondering if I should go w/ a different setup. What's been your experience? No, this is a CDW bag, but it is comparable to Eric's, I imagine. 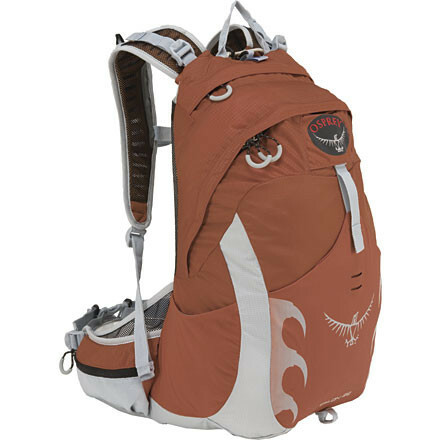 Honestly, that has not presented itself due to the typical terrain I ride in...very little off-the-back-of-the-saddle stuff here, and if there is, it is not typically where I would bikepack. But, I see your point and I think it would get in the way. Check out the upcoming mini-racks from Salsa Cycles. One of those and a small stuff sack and you would be in better shape for that kind of riding. I experimented a lot over the last 3 years of my cycling camping because I sleep very cold. I've got a RayWay quilt and I don't find it warm enough. I replaced it with a JacksRBetter Hudson River down quilt which packs smaller but still isn't warm enough for me. I have gone back to a bag, although I prefer quilts because I don't like me arms trapped, and am usng a Feathered friends Rock Wren. definitely warmer than the quilts but I haven't had aseriously cold night yet to give it a proper tryout. One item I can recommend as an aid to warm sleeping is the Exped Downmat. I used to use Thermarest but the Downmat insulates a lot better. HTH and I enjoyed your blog. Hey, Dexey. A few questions....what temps are you finding the RayWay quilt not enough for? The idea of a quilt appeals to me, but I have doubts about the lower edges at the body being cold spots. Just trying to get some perspective on what climate you are in. I live in England (Old not New) and at 5ºC I start feeling cold and don't sleep well. I think that is 40ºF. I tend to tour in the Welsh borderlands so the climate is Northern Maritime; a little different to yours but similar to where Kent Peterson lives in the United States. I had the draft excluders on the RayWay and fitted my own to the JRB. I haven't had trouble with cold spots; just cold all over :0) I still use the JRB quilt in warmer weather. I enjoy reading about your overnighters and I think the videos add a fine sense of place to the trips. They also help us blog readers put a face to the name and the words. And it is a good face, indeed. Your pleasant demeanor and your appreciation of the out-of-doors (not to mention your passion for mountain biking)are evident and do you credit. You come off as someone I'd like to share a trail with. But I'd have to bring my own food. Chunky chicken spread? Cheese bread? I will give you credit for the chocolate milk. I do most of my riding on the roads these days, sharing time with my wife and brother as we pedal through metric centuries throughout the summer months. But I do ride a mountain bike as well, and even raced my SS Gary Fisher Rig in the Spring Thaw Mt. Bike race in Ashland, Oregon this year. I was encouraged (brainwashed)by blogs such as yours to give SS mountain biking a try. I love it. Now I am feeling the draw of the S24O. Thanks for the encouragement. Please tell us about your new SS project. @David. Glad it has inspired ya! I would be happy to share the trail with you. About the chicken/bread thing. Tradition, my friend. 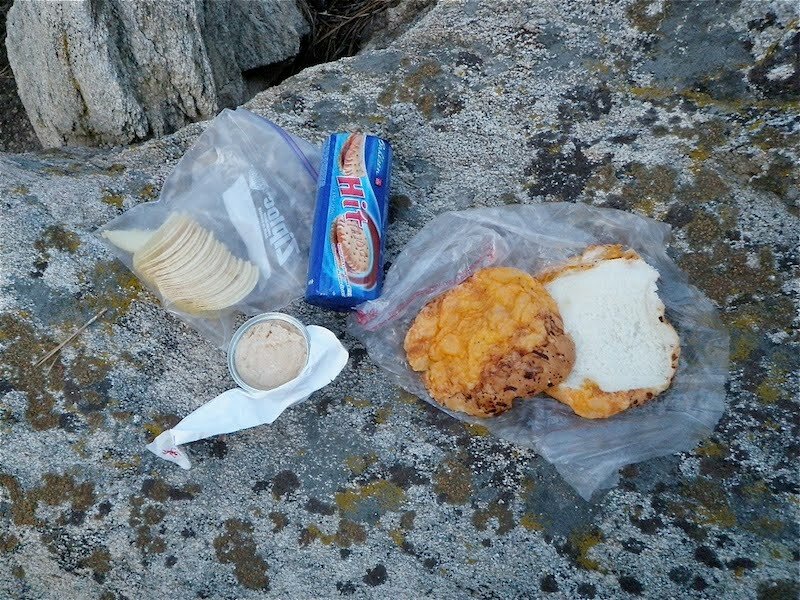 My early mentor in mtn biking got me into the chunky chicken spread and bagels as a way to bring lunch that travels well on long days. I never eat that at home, but after a long day of power bars or gu, that salty, greasy can of processed chicken parts is soooo tasty. The cheese bread is an optional upgrade in fats and grease. S24Os rock. They also are getting my act together so that I am ready for a longer trip(s). The new build will be up soon on twentynineinches.com. but I posted a pic in an earlier blog post...drill down a bit to "new pony in the stable" or something like that. Giant Anthem X 29er for 2011.